The government of South Korea is the latest fruit of a long development of governments in Korea. Enjoying the development as a nation over at least a 2,000 year period, South Korea has roots in the Three Kingdom period, Unified Silla Dynasty, Goreyo Dynasty, Joseon Dynasty, Japanese colonial era, and the most recent Republic of South Korea. The influences of Buddhism, Confucianism, and Christianity have been to most pronounced upon the development of democracy in South Korea. Having faced a determined communist dictatorship in the North, South Korea has still managed to create one of the most vibrant democratic communities in the world. The government of South Korea divides into three branches: executive, judicial, and legislative. The executive and judicial branches operate primarily at the national level, although various ministries in the executive branch also carry out local functions. Local governments operate semi-autonomously, and contain executive and legislative bodies of their own. The judicial branch operates at both the national and local levels. The Constitution of the Republic of Korea determines the structure of the South Korean government. The Constitution has been revised several times since its first promulgation in 1948 (for details, see History of South Korea), yet retains many broad characteristics. 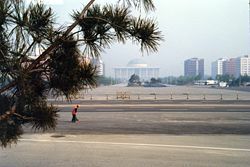 The country has always had a presidential system with a relatively independent chief executive, with the exception of the short-lived Second Republic of South Korea. A careful system of checks and balances maintains the stability of the three-branches of government. For instance, the executive and the legislature both have a say in appointing the judges of the Constitutional Court. Likewise, when the legislature passes a resolution of impeachment, the judiciary makes the final decision. Secretary Rice met with South Korean President Roh Moo-hyun at the presidential house in Seoul. Secretary Rice visited South Korea on March 19-20, 2005, the fifth stop of her trip to Asia. The president heads the executive branch. The people elect the president directly, the only elected member of the national executive branch. The Constitution permits the president one five-year term. The president serves as head of government, head of state, and commander in chief of the South Korean armed forces, vested with the power to declare war, and can also propose legislation to the National Assembly. He has the authority to declare a state of emergency or martial law, subject to the Assembly's subsequent approval. The president lacks the power to dissolve the National Assembly. That safeguard reflects the experience of totalitarian governments under the First, Third, and Fourth Republics. The National Assembly has the vested authority to initiate impeachment proceedings in the event of suspected serious wrongdoing by the president or cabinet-level officials. The Constitutional Court decides impeachment cases. The Prime Minister of South Korea, appointed by the president and approved by the National Assembly, assists the president in his duties. In the event that the president become incapacitated, the Prime Minister takes control of the state. The Prime Minister has the power to recommend the appointment or dismissal of cabinet ministers. The president, Prime Minister, and cabinet-level ministers comprise the State Council. Those ministers represent the eighteen ministries of the South Korean government. The Constitution charges the Council with deliberating on major policy decisions; the president chairs the meetings which the Prime Minister officiates. Although the Council lacks the power to make final decisions, the Constitution requires that the Council hear certain matters. Those include bestowals of state honors, drafts of constitutional amendments, declarations of war, budget proposals, government restructurings, and emergency orders. The president appoints the heads of the ministries. The ministers report to the Prime Minister. Many of these agencies are managed by intermediate agencies; others report directly to the Prime Minister or to the President. Board of Audit and Inspection—the chairperson of this board, charged with general administrative oversight, must be approved by the National Assembly. At the national level, the legislative branch consists of the National Assembly of South Korea. A unicameral legislature, a single large assembly of 273 members. Single-member constituencies elect most the legislatures, although 46 are elected through proportional representation. The members of the National Assembly serve for four years. In the event that a member becomes unable to complete his or her term, by-election replaces them. The Constitution charges the National Assembly with deliberating and passing legislation, auditing the budget and administrative procedures, ratifying treaties, and approving state appointments. The National Assembly also has the power to impeach or recommend the removal of high officials. The Assembly forms seventeen standing committees to deliberate matters of detailed policy. For the most part, those coincide with the ministries of the executive branch. Bills pass through those committees before they reach the floor. Before they reach committee, they must have already gained the support of at least twenty members, unless they have been introduced by the president. To secure final passage, a bill must receive a majority vote from those present; a tie vote fails. After passage, the legislature sends the bills to the president for approval; he must approve them within 15 days. Each year, the executive submits the budget to the National Assembly. By law, the executive must submit the bill at least 90 days before the start of the fiscal year, the final version must win approval at least 30 days before the start of the fiscal year. The Assembly has the responsibility to audit accounts of past expenditures, which must be submitted at least 120 days before the start of the fiscal year. Sessions of the Assembly may be held regularly (once a year, for no more than 100 days) or extraordinarily (by request of the president or a caucus, no more than 30 days). By default, the Assembly holds open-door sessions. The session can be closed to the public by majority vote or by decree of the Speaker. A quorum of half the members must be present in any session to pass laws. Currently, five political parties of South Korea have representation in the National Assembly. The Constitutional Court heads the judicial branch, a system newly established in the Sixth Republic to help guard against the excesses of past regimes. The Constitutional Court consists of nine justices. The Chief Justice of the Supreme Court, the National Assembly, and the president each recommend three. The president makes the appointments official. The national president appoints the President of the Constitutional Court, subject to the approval of the National Assembly. The members of the court serve for six-year renewable terms until the age of 65 (70 years old in the case of the President of the court). 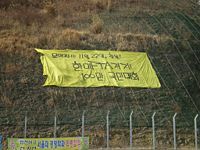 Banner opposing the free trade agreement between the US and South Korea in Hapcheon, Gyeongsangnam-do, South Korea. The Constitutional Court conducts constitutional review and rules on cases of impeachment. The Supreme Court oversees other judicial matters, the final court of appeal for all cases in South Korean law. The Supreme Court, seated in Seoul, consists of 14 Justices, including one Chief Justice. The Justices must be 40 years or older, and have at least 15 years of experience practicing law. The Constitution restricts the Chief Justice to one term while the other justices may receive multiple appointments. South Korean National Assembly Building viewed from front. Below the Supreme Court come appellate courts, stationed in five of the country's major cities. Appellate courts typically consist of a panel of three judges. District courts, which exist in most of the large cities of South Korea, come below those followed by branch and municipal courts, positioned all over the country and limited to small claims and petty offenses. Specialized courts hear family, administrative, and patent cases. The national judiciary adjudicate all courts; the Constitution prohibits independent courts. Judges throughout the system must pass a rigorous training system including a two-year program and two-year apprenticeship. The Judicial Research and Training Institute conducts all judicial training; only those who have passed the National Judicial Examination may receive appointments. The Chief Justice of the Supreme Court has the power over all court administration, and can recommend court-related legislation to the National Assembly. First Republic established Local autonomy as a constitutional principle of South Korea. For much of the twentieth century that principle has been dishonored. From 1965 to 1995, provincial governments, run directly by the national government, ran local governments. Since the elections of 1995, a degree of local autonomy has been restored. In each of the primary and secondary administrative divisions of South Korea, that is, in every province, metropolitan or special city, and district, local magistrates and assemblies run for election. City or county governments appoint officials at lower levels, such as eup and dong. As noted above, the judicial branch enjoys freedom from local autonomy. Independent national agencies manage many other areas, including fire protection and education. Local governments also have extremely limited policy-making authority, usually limited to the implementation of national policies. Recently, local governments have been pressing for more authority on the local level. The central government appoints deputy executives, while popular local elections determine the chief executive. Deputy officials have authority over the details of most administrative matters. Although efforts at openness and reform have been ongoing, the large South Korean civil service remains a largely closed system. Candidates for civil service positions unusually have to pass one or more difficult examinations. Although positions traditionally had been handed out based on seniority, in a complex graded system, reforms in 1998 substantially eliminated that policy. More than 800,000 civil servants work in South Korea today, half employed by the central government while local governments employ only about 300,000. With on a few thousand employed by the national legislative and judicial branches, the various ministries of the executive branch employ the overwhelming majority. The size of the civil service increased steadily from the 1950s to the late 1990s, but has dropped slightly since 1995. Career civil servants and contract civil servants, with the exception of political appointees and elected officials comprise the civil service. Contract servants typically receive higher wages for specific jobs. Career civil servants make up the bulk of the civil service, arranged in a nine-tiered system in which assistant ministers occupy grade one and the newest and lowest-level employees grade nine. A combination of seniority, training, and performance review determines promotions. Civil servants' base salary makes up less than half of their annual pay; a complex system of bonuses determines the remainder. Contract civil servants receive pay based on competitive rates of pay in the private sector. Elections are overseen by the National Election Commission of South Korea. 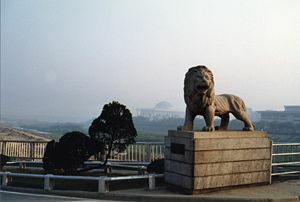 Korea Overseas Information Service (2003). Handbook of Korea, 11th ed.. Seoul: Hollym. ISBN 1-56591-212-8. History of "Government of South Korea"
This page was last modified on 8 July 2017, at 19:59.